Annual Offshore Technology Conference Preview and, after a one year absence, a return of the world fa- mous OTC EXPOSITION. U.S. GULF COAST YARDS • PLUS—A wealth of current marine business and technical information first—weeks before the slower monthlies. Commission for Maritime Services' con-1 ference. WORLDWIDE SHIP REPAIR • PLUS—A wealth of current marine business and I technical information first—weeks before the | slower monthlies. Protection - A review of the latest ad- vance in coatings and corrosion control technology that can provide cost savings for vessel owners. • PLUS—A wealth of current marine business and technical information first—weeks before the slower monthlies. PLUS—A wealth of current marine business and technical information first—weeks before the slower monthlies. Yearbook (June 1) and the regular June 15 issue, into the largest data- filled and most informative marine industry yearbook in the world. Vital statistics dealing with the worldwide shipping and shipbuilding industry, inland waterways, offshore drilling and the world Navies will be covered in great detail, with current status and future trends articles authored by world experts in each area. 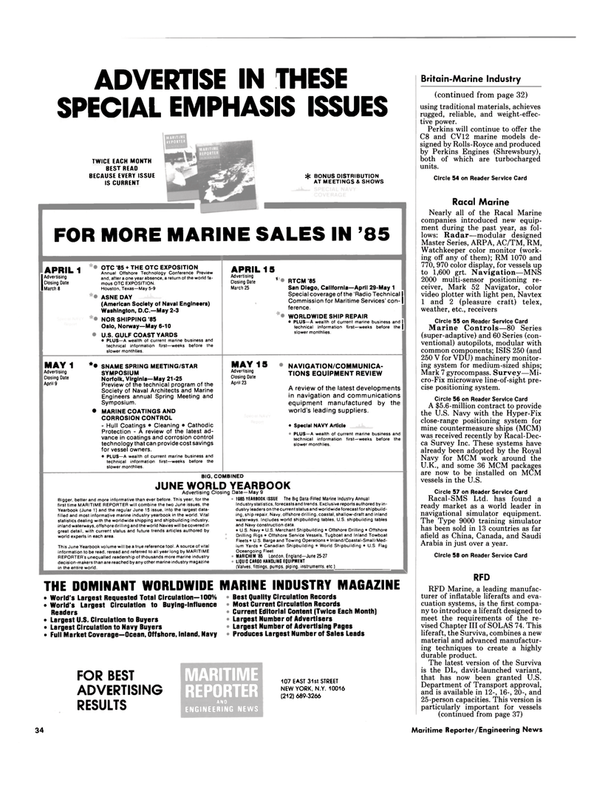 REPORTER'S unequalled readership of thousands more marine industry decision-makers than are reached by any other marine industry magazine in the entire world. Britain-Marine Industry (continued from page 32) using traditional materials, achieves rugged, reliable, and weight-effec- tive power. C8 and CV12 marine models de- signed by Rolls-Royce and produced by Perkins Engines (Shrewsbury), both of which are turbocharged units. Mark 7 gyrocompass. Survey—Mi- cro-Fix microwave line-of-sight pre- cise positioning system. U.K., and some 36 MCM packages are now to be installed on MCM vessels in the U.S.
Racal-SMS Ltd. has found a ready market as a world leader in navigational simulator equipment. Arabia in just over a year. RFD Marine, a leading manufac- turer of inflatable liferafts and eva- cuation systems, is the first compa- ny to int roduce a liferaft designed to meet the requirements of the re- vised Chapter III of SOLAS 74. This liferaft, the Surviva, combines a new material and advanced manufactur- ing techniques to create a highly durable product. The latest version of the Surviva is the DL, davit-launched variant, that has now been granted U.S.